Two people have been killed in Gaza, including a paramedic on duty, the Palestinian Health Ministry reports. The Palestinian Red Crescent reports that 121 have been injured and that 57 of these were hit by live bullets. “Abdullah volunteered with the Medical Relief Society to provide medical assistance to affected people during the March of Return,” it said. Qatiti was killed in Rafah in southern Gaza and five other paramedics have been injured. Saeed Aloul was reported dead by the Health Ministry. Journalists Alaa Abdel Fatah and Mahmoud al-Jamal have also been injured, local media reports. 32 people have been treated for tear gas, with eight tear gas canister burns reported by the PRCS. 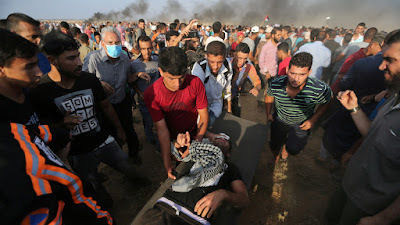 The violence took place as Palestinians in Gaza continue their weekly March of Return protests amidst heightened attacks between the Israel Defense Forces and Hamas’ al Qassam Brigade. An Israeli airstrike killed three people on Wednesday, including a pregnant woman and her 18-month-old daughter. Rockets fired by Hamas have not killed any Israelis. The weekly protests see Palestinians calling for their right to return to the land they were expelled from during the foundation of the state of Israel. More than 150 Palestinians have been killed since the protests began on March 30. Qatati is the third paramedic to be killed in the protests.